This is the third book in a series by Suzanne. I hadn’t read the first two (though loved this book so much they’re now on my “to buy” list ) so wasn’t sure how I’d fare with it. No problems though, Suzanne’s writing is easy to follow, though not in any way “dumbed down” as so many paranormal books seem to be now 😦 I did read the samples of books one and two to get some background info. Heroine DJ is a great girl – I loved her. She’s always out for doing what’s right and what’s best and yet she seems unable to stay out of trouble. Her job isn’t supposes to be that dangerous, but it seems that peril follows her round every corner and she’s not one to step back when she thinks a job needs doing regardless of personal risk. 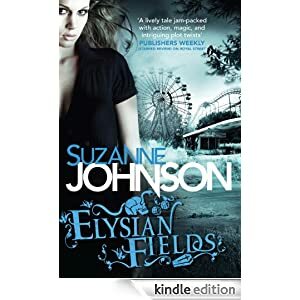 It’s a fantastic world Suzanne has created, something fresh and new and a change from the usual paranormal fantasy we read. It reminds me a bit of Alison Pangs and Suzanne McLeaod’s writing – the same kind of way that she has taken predictable races but made them different. The novel is peopled with characters such as the Historical Undead – not vampires, but people from history who are able to cross from Beyond to this world according to how well they are remembered. So for Jean Lafitte, for example, crossing to New Orleans and staying for a while is easy, given that there are so many outlets in the city carrying his name. And what a fabulous character he is, Undead or not he’s swoon worthy though female lead DJ isn’t sure about trust worthy 🙂 everything comes at a price from him, and he loves to have her owing him favours….then there’s Alex, another gorgeous guy,shape shifter and cousin to Jake, who’s now a loupe-garou, a sort of rogue shape shifter…Alex was DJ’s work partner but has been promoted. He and DJ can’t decide whether they are just good friends or want something more, and Jake – well he and DJ were dating (I think) certainly on the verge of it, when he was attacked and he’s struggling to contain his other self. That means he could face being killed by the enforcers of the paranormal world…its a story full of adventure and mystical people. Add to those I’ve mentioned some Mermen (and ladies I guess), Vampires and Elves, and DJ’s neighbour enigmatic Rand, who is boyfriend to her best friend Eugenie, and you can see what a fantastic adventure from this cast of characters can be created. And it is, fantastic, I was hooked from the start, drawn along a ride that seemed to rip from one climax to another. Just as I paused for breath something else would happen. Poor DJ, targeted for death by the Axeman, a serial historical killer who’s returned for a new spree, the Elves dislike her, Jean still trying to get into her pants, Alex is hinting at more than friends, Jake angry at her, Rand hanging round despite her telling him to get lost and Eugenie worrying about his always being at DJ’s house….it’s a breath taking adventure full of twists and turns. Who is Rand really and why does he keep prying into DJ’s life, why is the axeman targeting her, why do the Elves dislike the Elven artefact staff attaching itself to her, will Jake get control of his wolf, and as always there are power struggles at the top of the preternatural councils. It seems the questions never stop. And yet, among the madness there is light (yes, I’m an Experiment in Terror fan too !!) and Suzanne pulls the story together brilliantly. Ties up all the loose ends, and sorts out the chaos to end on a very rewarding and satisfying note. It’s one of those novels where when you finish you feel satisfied and yet a bit sad not to be enmeshed in that fictional world any more, its so absorbing that this world leaves your mind and you’re pulled into to the fictional one for a while. I’m a definite reader of Suzanne’s work now and though the book may seem expensive at £6.99 for 384 pages it’s worth every penny. I can’t wait to get the past two and re read the whole series. Stars: a cracking read and worth the full five easily.